For most companies, maximal uptime is an absolute must. Being available at all times and everywhere is even crucial for e-commerce websites and business-critical applications, online campaigns and providers of Software-as-a-Service. Each and every single-point-of-failure has to be removed precisely and proficiently. Nucleus offers Uptime-as-a-Service. We guarantee that your website or application will remain online; whatever happens. That’s because we identify, monitor and optimize all aspects that (could) have an effect on your uptime. The more crucial your website or application is for your operations, processes and customer relationship, the higher the required availability. 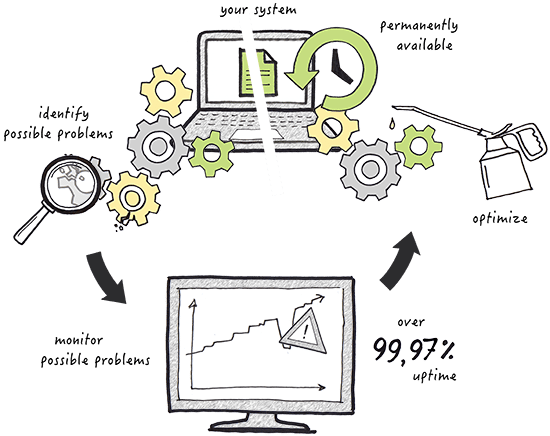 Do you manage critical applications that require an uptime of at least 99.99%? Then it is best to deduplicate them at several locations. A good architecture and a robust infrastructure are important. But the quality of the network plays a vital role as well. A single error can completely paralyze your company. A sound business continuity plan that takes all types of factors into account protects you against all risks. What does uptime mean for you?